This year’s Toronto Film Festival seems to be a high point in screenwriting veteran John Ridley’s career. Aside from the success of 12 Year’s a Slave, which he wrote for Steve McQueen, he premiered his feature-length directorial debut, All is By My Side, about famed guitarist Jimi Hendrix. 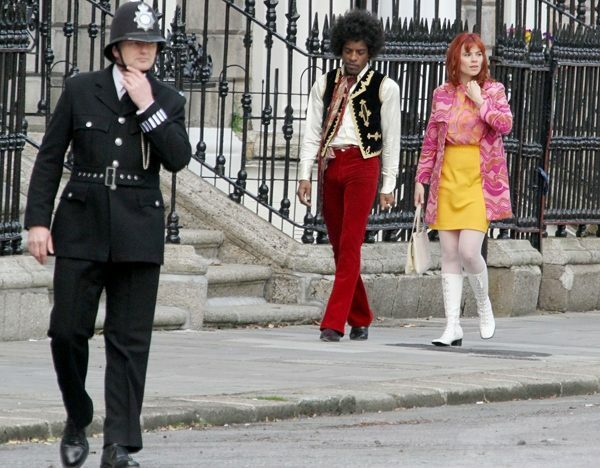 The biopic was well-received, earning praise for its intimacy and its ability to capture the essence of Hendrix without using any of Hendrix’s big hits (the rights were on lockdown). Instead, the music presented within the film are covers, including a few from The Beatles. The film, also written by Ridley, only covers the years 1966-67 in Hendrix’s life, before he broke into the UK and became a rock legend. Andre Benjamin, better known as music artist Andre 3000, was tapped to play Hendrix, and from the sounds of the reviews does a solid job portraying both the quiet manner of the man and the seductive power of the rising star. Benjamin is joined by Imogen Poots, who plays Linda Keith, Keith Richard’s girlfriend, and Hayley Atwell, who plays Hendrix’s longtime girlfriend Kathy Etchingham. Keith is the woman who pushed Hendrix to have a career of his own and eventually introduces him to both LSD and manager Chas Chandler (Andrew Buckley), while his relationship with Etchingham ” produces scenes of tenderness and violence” (Owen Gleiberman, Entertainment Weekly). Both relationships play an important role within the film building a portrait of a man that is “sympathetic, but not flattering” (John DeFore, The Hollywood Reporter). It is also mentioned in the majority of the reviews that the movie is by no means commercial. Its content and style aim to create the ambiance of ’60s rock and roll. Gleiberman states, “A lot of the dialogue sounds semi-improvised, and the whole vibe and tone is less a matter of crystalized dramatic events than of sitting around in clubs and apartments, hanging out and drinking and smoking dope, exchanging a lot of casual, half-heard banter about what’s going down.” Henry Barnes of The Guardian shares a similar sentiment saying, “you leave it thinking that the essence of the man – exposed through the people around him – has been brought to the fore. Hendrix was never easy to pigeonhole. All Is By My Side has him, if not in sound, then in spirit.” All is By My Side appears to be an exciting triumph for Ridley, abandoning the expected biopic tropes in favor of the freedom and spontaneity that Hendrix himself exuded through his music.